Not too long ago, I found myself temporarily a bachelor for the weekend. The wife and the boy were on a trip, but due to work constraints, I couldn’t join them. Now, plenty of guys would take advantage of this situation by simply ordering a pizza and calling it a night. 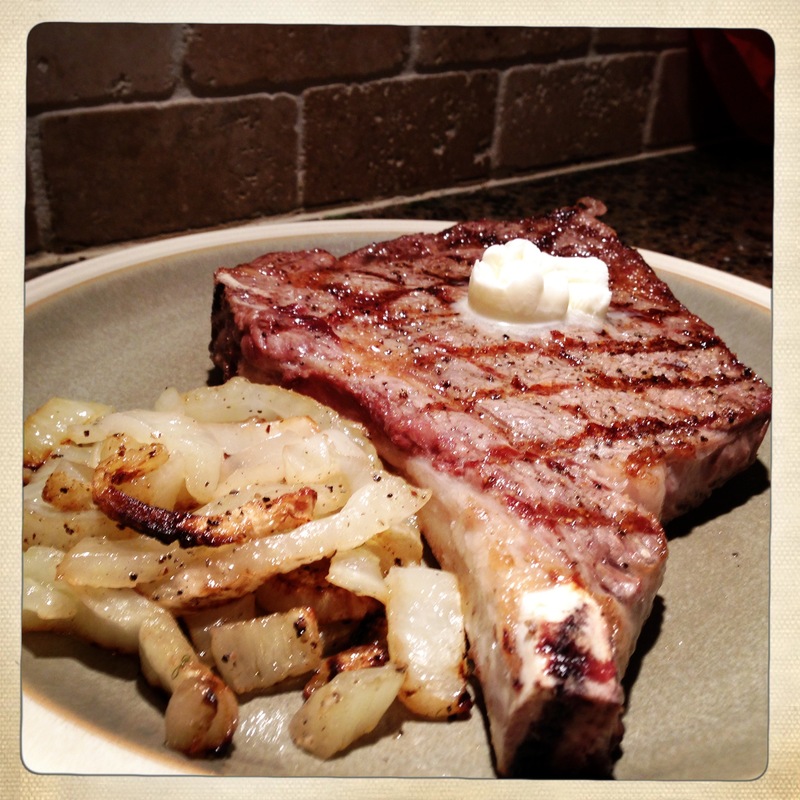 I had other ideas… Specifically, a bone-in ribeye and some fennel. There are few things that look as impressive on a plate as a well-marked steak. The biggest secret is that it’s actually really easy. 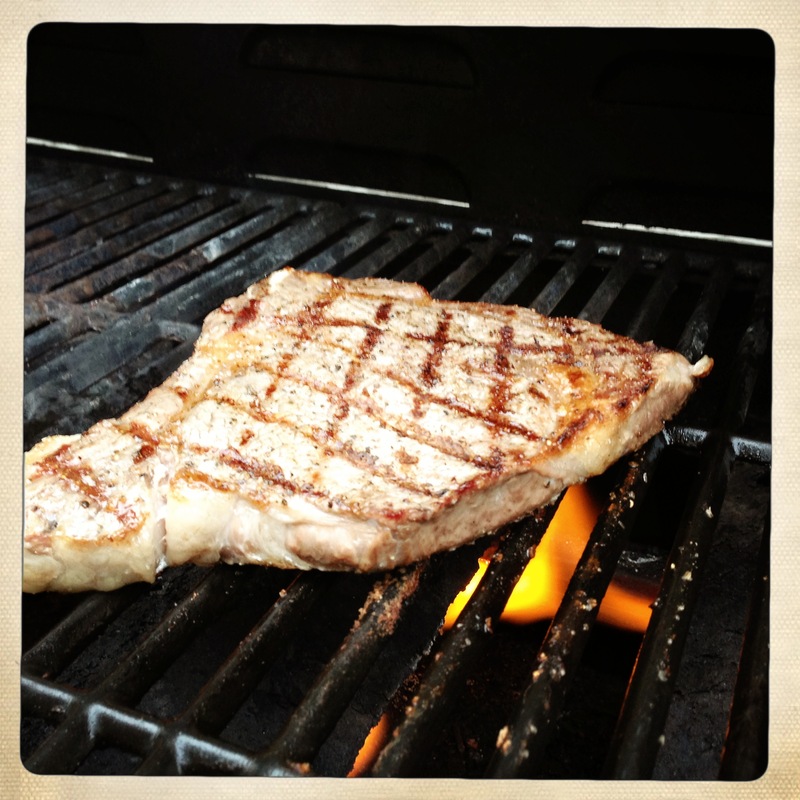 It may take a little practice to get it exactly to your liking, but overall it’s easier to grill a steak than just about any other item you will ever place over an open flame. 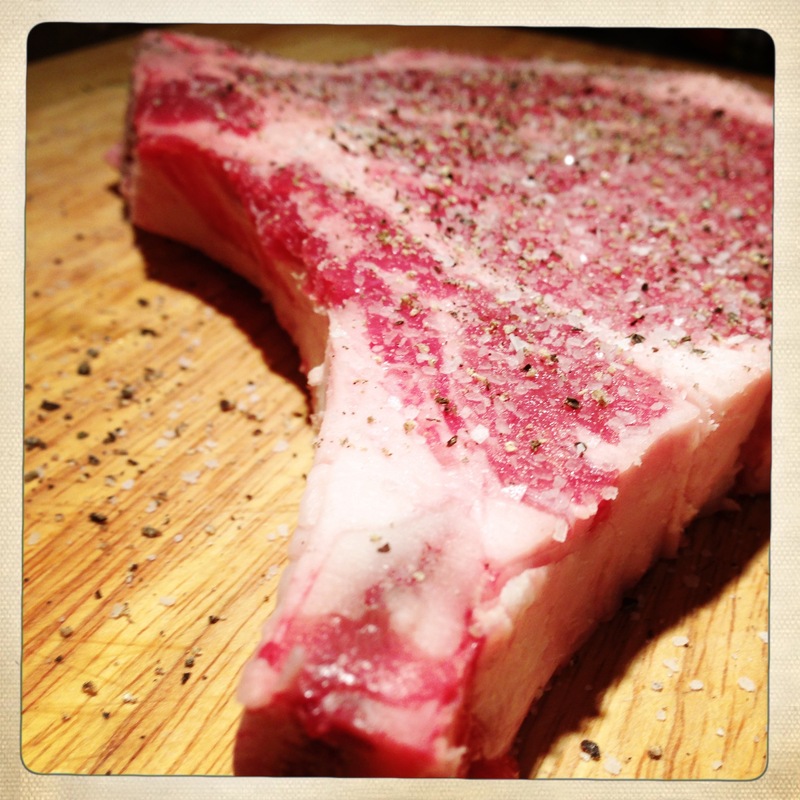 There are a few things to consider when grilling steak. First, decide what cut you like. 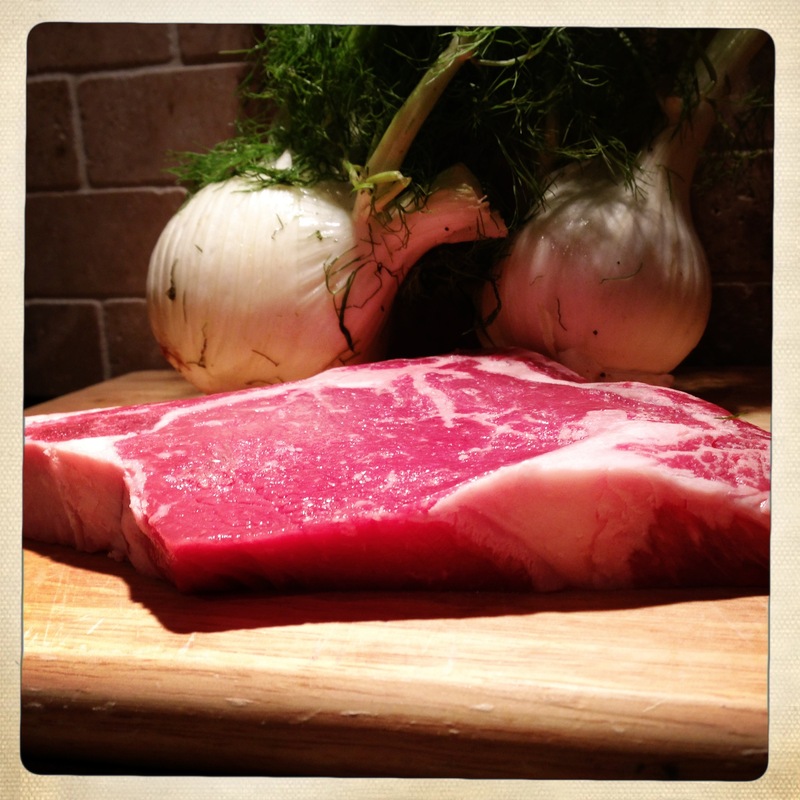 I personally always go for a ribeye because I think it has the most flavor due to the marbling, but is still tender. Second, think about the thickness. If you like your steak in the medium rare range, you should go for a thicker steak (at least an inch), because this will give you a bigger margin of error to get the outside nicely seared without overcooking the center. That’s really about it. So, next you need to get your grill hot. 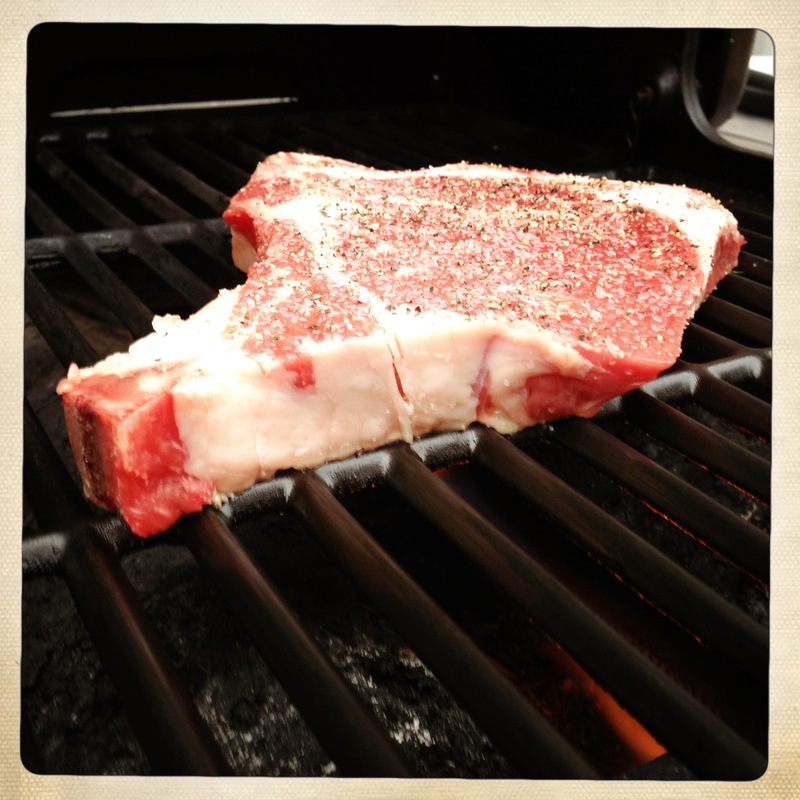 I like to do steaks over a medium-high heat – for reference, the thermometer on my grill was reading 500 degrees. As far as prepping the meat, you don’t need to do much. Season both sides liberally with salt and pepper, and let the steak get up to room temperature while you preheat the grill and prep any sides you may be making. The salt will draw some of the fluid out of the meat to the surface, which will help it form a nice crust when you sear it on the grill. The fennel was an experiment. I love fennel, but I’ve never really tried to make it. I remember having it as an appetizer at an Italian restaurant several years ago, but have never really figured out what to do with it. I decided to try it on the grill, and I made it the way I make almost all vegetables on the grill – in a foil packet. I sliced the bulbs and removed some of the toughest outer pieces. I cut the slices into strips and seasoned with salt and pepper. I placed them on some foil, drizzled with olive oil and folded the foil into an envelope around the fennel. I shook the envelope to evenly coat the fennel with oil and seasoning. I placed the fennel on the grill for about 5 minutes before I started the steak. There’s no real science to grilling the fennel – I just flipped it every time I moved the steak, and I think it was probably on the grill about 15 minutes total. 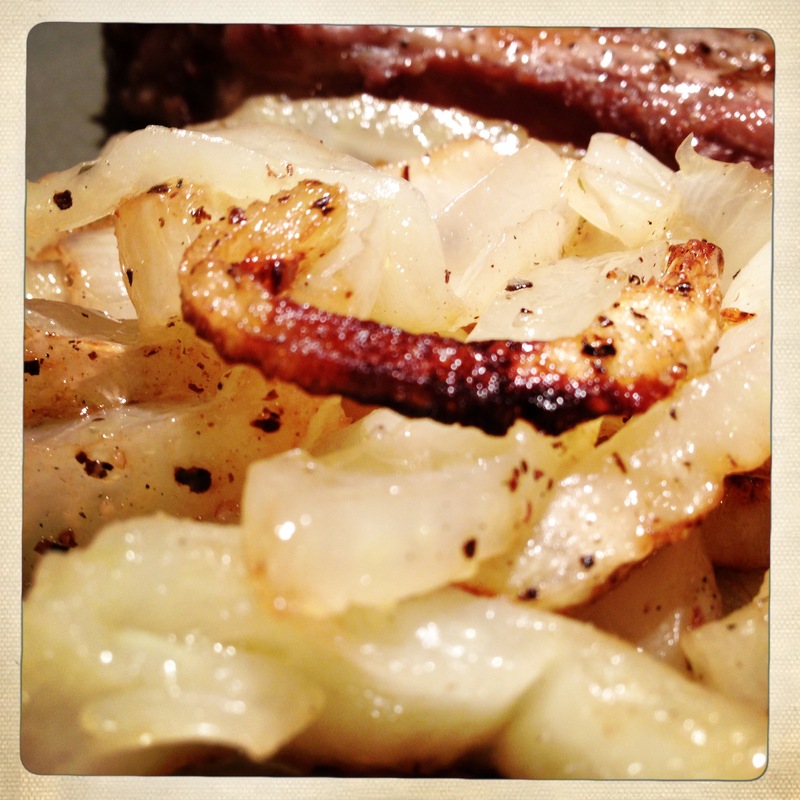 After about 5 minutes, I flipped the fennel and placed the steak on the grill. I let it sear for about 3 minutes and then gently turned it about a quarter turn to create the nice crossed grill marks that everyone loves. 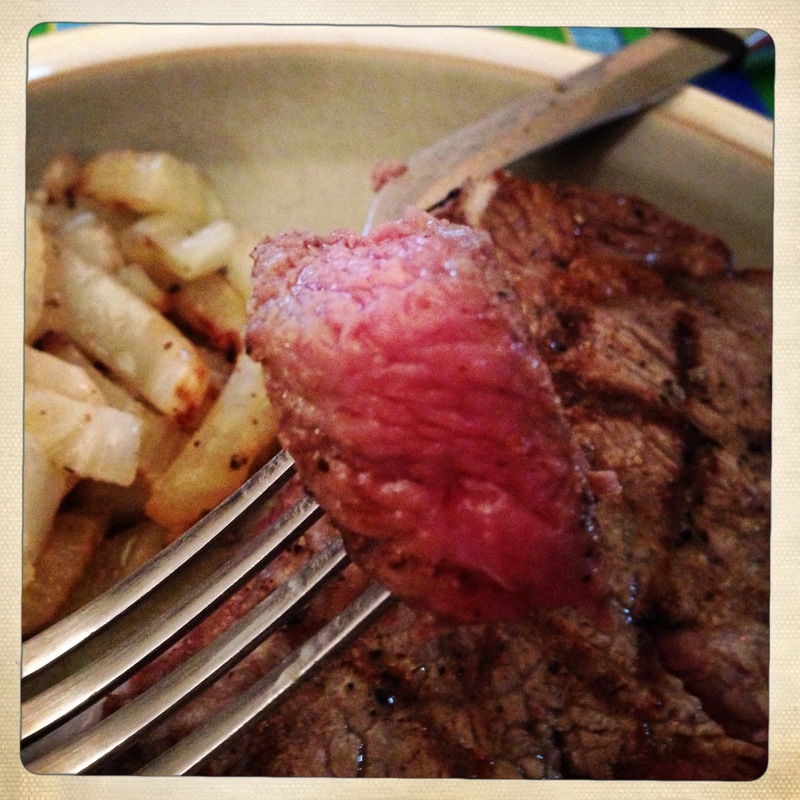 I grilled the first side for another 2-3 minutes and then flipped the steak. The fennel was delicious. I don’t really know how to describe the flavor if you’ve never had it, but it’s delicious both raw and cooked. It may be more of an acquired “adult” taste, but I plan to let the little guy try it soon just to see what he thinks. This steak was every bit as good as I’ve had in plenty of restaurants. 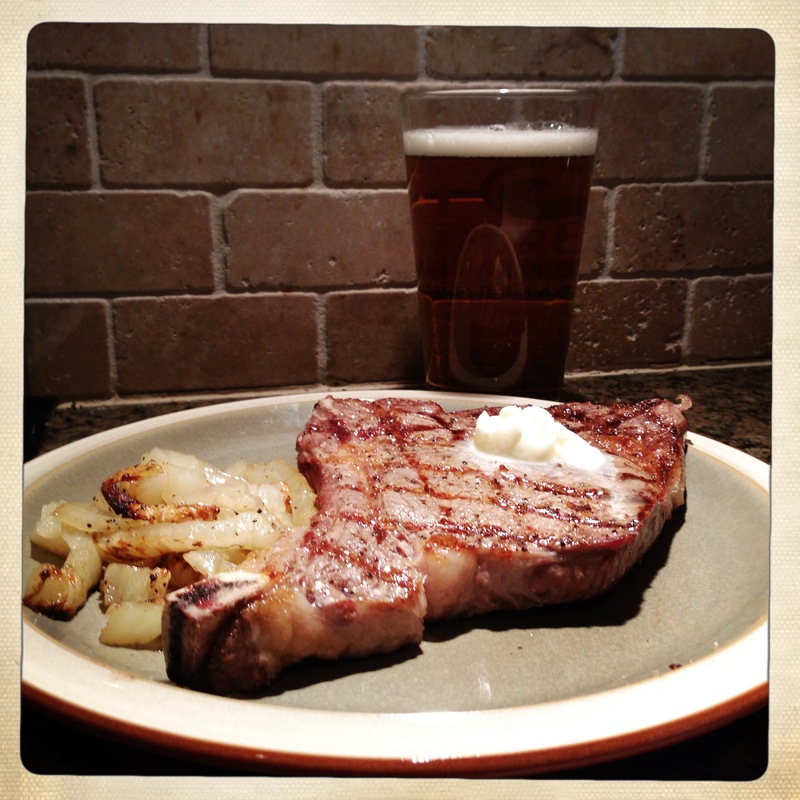 Just remember, when grilling steaks, less is more – don’t over think it and don’t overcook it. There are few things as satisfying as the first bite of a perfectly grilled steak, but the next bite is a close second… Enjoy!